I love nail polish and have tried many brands, but I’ve never tried a gel nail polish that you have to cure. 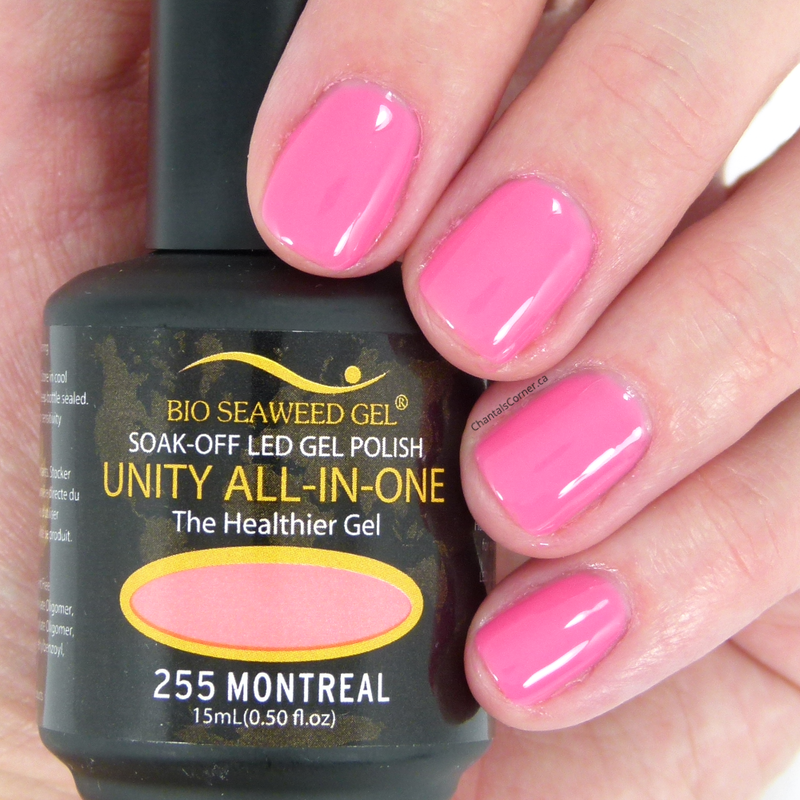 That is until I tried some Bio Seaweed Gel nail polish. I received two colours from their new Uptown Lights collection to try out: 255 Montreal and 256 Ottawa. I’ll give you a little how-to about the nail polish before I show you the colours I received. This nail polish has quite a unique smell that I did not find pleasant. Thankfully the smell goes away once the nail polish is cured. (1) Since the nail polish stays in liquid form until you cure it, I found it best to only do two nails at a time. Because my nails are very curved, I found if I did all my nails at the same time the nail polish would slide down and pool at the side of my nails, so I felt like I was constantly cleaning them to have clean cuticles. By only doing two nails at a time I was able to prevent that “leaking”. 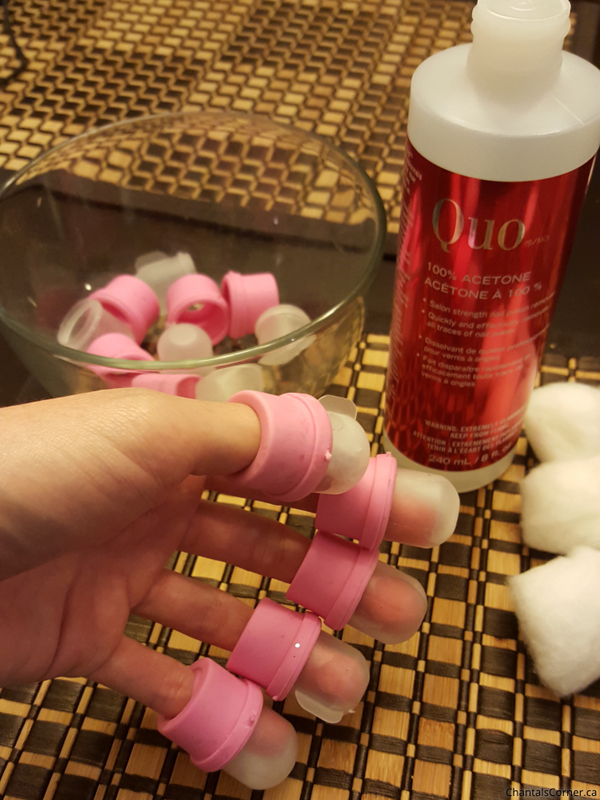 (2) I found it best to cure my nails four times. 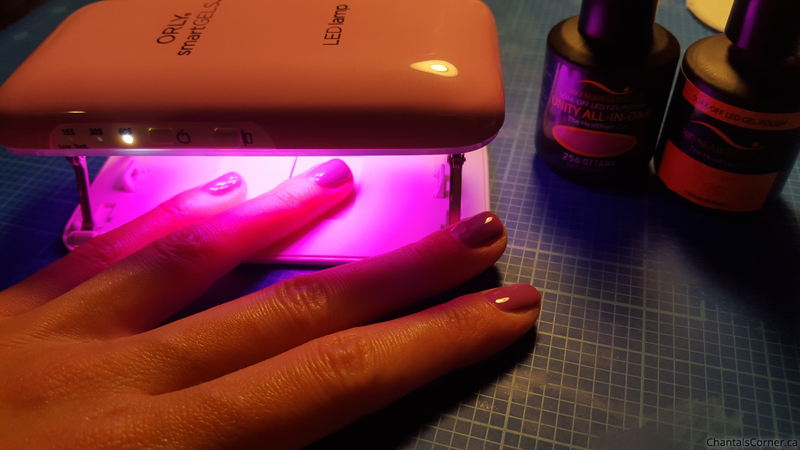 I know it sounds a bit crazy, but let me explain… by curing them flat, the sides and tips of my nails did not get exposed enough and the nail polish did not cure well (you’ll see what I mean later in this post). So the first time I cured my nails I had my fingers flat on the surface (like in the picture above), then the second time I’d tip my fingers a little to the left to get the side, then a third time with my fingers tipped a little to the right, then a fourth time with the tip of my nails facing the light (while I held it with the other hand). I like to wrap the tips of my nails in nail polish too because it makes the manicure last a little bit longer. However, if you have a light that takes care of all angles (like the Bio Seaweed Gel LED light) then you’d only need to cure them once. Removal is easy: soak your nails in acetone for 5 minutes then push off the nail polish with an orange stick. For me the nail polish came off mostly in once piece and was really easy to remove. Alright, enough with the chatting – let’s look at some swatches! Ottawa is a beautiful violet shade. The formula on these nail polish is quite thick. I love the brushes because they’re wide and thin. 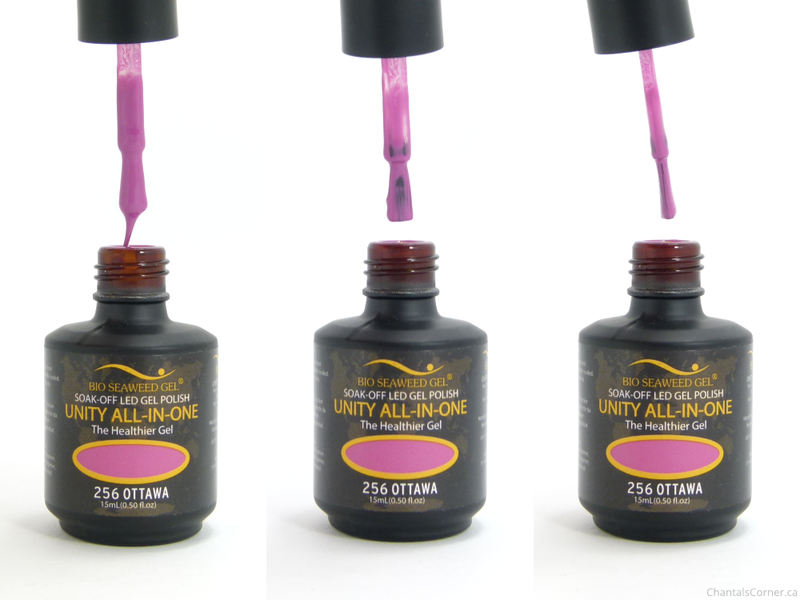 The formula may be thick, but you need to apply thin layers to help prevent the pooling at the cuticles that I mentioned above. With this colour I put two layers of colour followed by a layer of top coat. Look at that shine!!! Seriously. WOW. Do you see that little smudge area on my pinky? That’s from where the nail polish was not quite cured on the side and it smudged once I touched it. 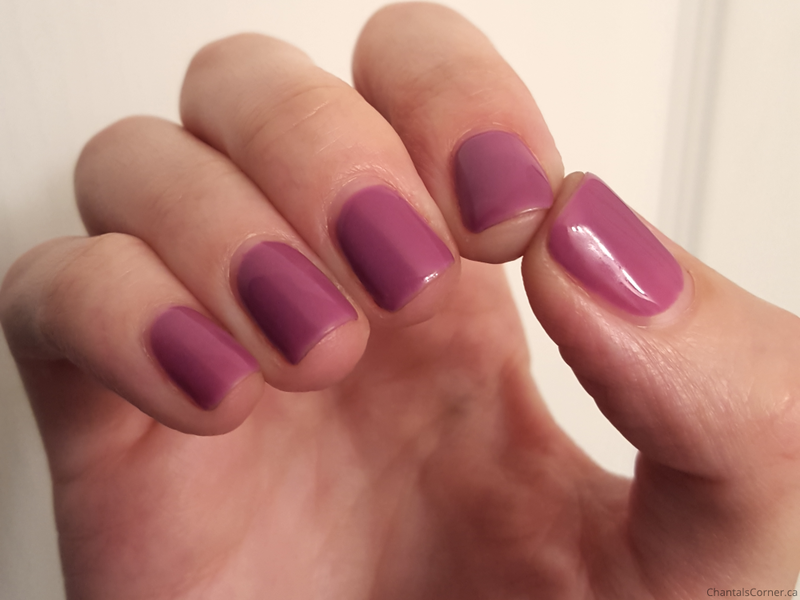 This is the first colour I tried and I kept it on for 8 days, and this is what my nails looked like just before I removed the polish on day 8. Also, see another smudge on my thumb? That’s another spot where the polish was not fully cured because of the indirect light in the lamp. Not a single chip, minor tip wear, and still as shiny as day 1 – which you can’t see from this angle, but it really is. How awesome is that?!? Montreal is a beautiful bright pink. I had a bit more trouble with this polish pooling at my cuticles, so after I did my index and middle finger together, I did my ring finger and pinky separately (but cured the sides and tips together). The formula is the same as Ottawa (thick). These were my first tries with gel nail polish and I’m in love! The smell I could do without and there was a bit of a learning curve, but you really can’t beat that shine and wear. Polish me impressed! Have you tried a gel nail polish before? If you want to try Bio Seaweed Gel, use the code CHANTALSCORNER on their online store and you’ll save $10 on your order!